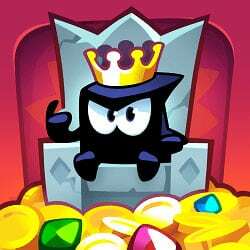 From the creator of award-winning Cut the Rope series comes King of Thieves, a fun cartoony adventure game. Travel to 80 different dungeons, filled with dangerous trapped that’ll kill any invaders, but you’re not just anyone, your dream is to become the King of the Thieves. Avoid blades, monsters, and others contraptions and steal all the gold inside the dungeons to become the world’s richest man or woman. Dodge traps and steal gold in this unique platformer. This amazing game is loved by millions of players worldwide! STEAL SHINY THINGS. Collect gold and gems to become the wealthiest thief in the world! Leap into this awesome game that combines the best of platformers with the excitement. Design dungeons, steal treasure and find out if you’ve got what it takes to become the King of the Thieves. This game maybe well known for you from your mobile device. In a browser this game is a little shorter, however the task has stayed the same – avoid to all obstacles and enemies and get yourself to the chest full of gold. Can you do it? Have fun. This game can be played on all devices. Enjoy and have fun. King of Thieves is a free online mobile game on Hidden4Fun.